Happy Tuesday Loves! This week started out with a bang! I totally got caught out in our barn for 2 hours yesterday during one of the craziest storms we've had in a while! Doors were being banged off their hinges, our lawn furniture was carried away with the wind, and one of our trees was split in half because of the wind and rain! Needless to say, being in a metal barn was a little scary! Love this top! The print, colour and texture are perfect! Anyway..aha, cute outfit girl. 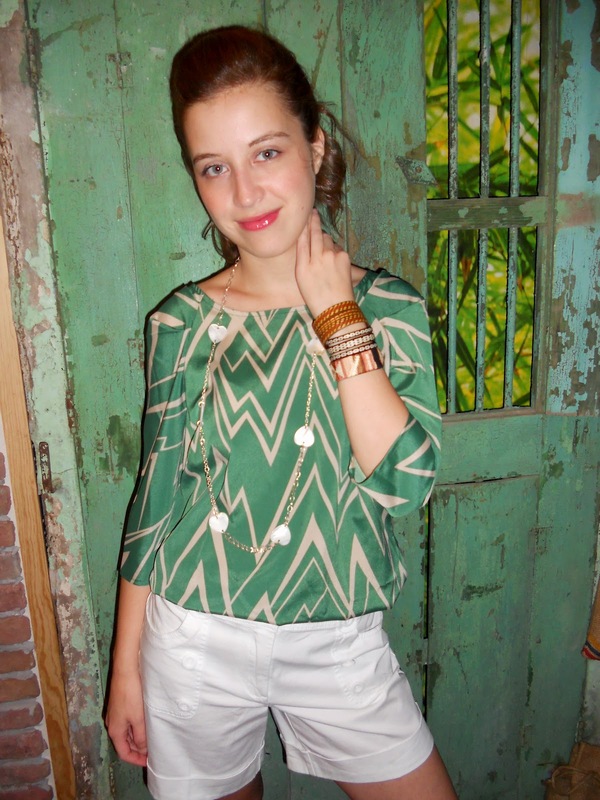 Love the bold zig zag pattern on your top! Oh uau, what a storm! :/ Beautiful top! CUTE shoes. I'm in love with them!!! How scary! Glad to hear you're Okay! Love your outfit. Really like those shoes! Oh you look so lovely! I love the color and pattern. Also, this may sound random, but that door behind you is fantastic! Love white shorts!! And love this outfit on you. i like the top here. Great Top! Reminds me of a southern gal. I love this top! It looks so perfect with the white shorts. I think white shorts might be my next purchase... I can really see them going with everything! That is a great top and those sandals are amazing! 9 West has done a great job designing new looks this season! Love that shirt and nice shoes!! Scary about the storm--glad you're ok though! Aww, how cute is this top!! Loves it, great colour and I like linear prints. You look adorable hun! I love this outfit! So cute. You have some of the most fabulous prints. Also you should do hair tutorials because you always style your hair in such cute ways. I could learn a thing or two! Thanks for your sweet comment on my blog !! I really love the outfit!! Do you want to follow each other ?? you are very beautiful! !i love your t-shirt!! I follow you already, would you like to follow me back? Glad your okay cause it sounded like a crazy storm! Wow, that's really scary. I'm happy you're alright. I would've probably been scared out of my mind. Anyhoo, I love this look. As soon as I saw your shoes I knew they were from Nine West. I've always adored them. : )I also really like your zigzag shirt. It's a great pattern that's not too busy. Ahh I love your gorgeous outfit! And your hair and makeup look fantastic too! Crazy storm! I'm glad you're okay. I'm sorry to hear about the crazy storm. Hope the barn survived. Yikes! That sounds like a scary experience! I'm glad you're okay - storms can be so dangerous! the pattern zigzag and the color are great! love the pis and the color of the blouse! elegant in a particular way! What a cute blouse. Truly lovely! Amazing top! And such cute accessories! so in about 3 day's i've grown to love your blog! great shirt and so love those braclets!!! I adore your simple, classy & elegant style! So chic! You look like the girl next door. Beautiful! Thanks for your last comment on my blog. I am in love with that necklace too! Wow, sounds like a crazy storm! Love your outfit, that color of green is very pretty. I love the zig zag print! Also, I just announced a giveaway to win a beautiful necklace, enter my giveaway HERE! That is such a fabulous top - and it looks great with that background! oh my gosh i LOVE this outfit! you look so cute! happy tuesday back at you love. I have those shoes they are my absolute favorite! You are looking very fresh faced in this look! OMG I LOVE that top! You look gorgeous Love! great zig zag blouse - and I just love the color of the door behind you! I can't even imagine - glad you're okay! Super cute outfit, perfect for this time of year. what a scary experience! Glad you guys are ok. YOu look adorable. I love your top. oh whoah!! hope nothing got too wrecked during the storm! Sounds totally exciting and quite romantic ;) If you were stuck with a boyfriend haha! Cute! Love the shade of green. gracias por comentar en bruna, nos encantan el estilo que tienes, si te apetece podemos seguirnos mutuamente! Really adorable, love the door behind you too!! thank goodness you're all ok! Love that green top, it's such a great pattern. cute outfit! 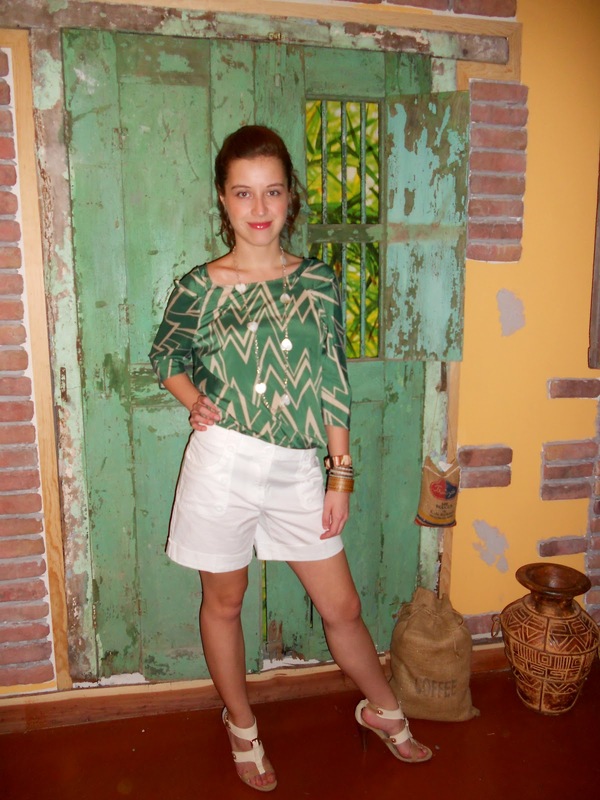 Love the green and white combo, so spring! The color of that top is beautiful. I love blues and greens! really fresh and springy look!! Love the color of the top, really chic outfit! Great colors!! Love this outfit.